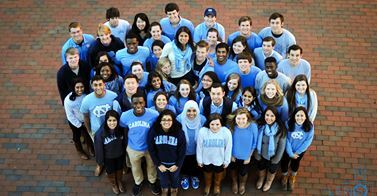 CHAPEL HILL, NC–Saying that they intend to “advocate for change” and “address the most pressing issues faced by the University community,” smiling, well-dressed students from all walks of life squeezed close together all around campus this week to make a difference. Clusters of convivial, high-minded young adults have appeared everywhere from in front of the Old Well to the steps of the South Building, to the exact center of the Pit. Around the state, policymakers have started to take notice. Many in the UNC-CH community expressed support of the tastefully attired, heterogeneous bands of youths. Though the energetic, well groomed members of each gathering expressed preference for their own spunky bunch over others, all seemed united in their resolve to make Carolina great by standing next to each other in just the right natural light. The haggard, grimacing student body president and his anxiety-ridden executive cabinet, clustered together in their offices, were unavailable for comment.